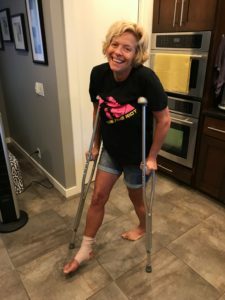 Here’s what’s emerging from my summer break on the Isle of Immobility, after fracturing my ankle in two places in the middle of a big move to another state. 1. Removing Options Has Simplified Life. I like things a certain way. More than I knew. I’ve been forced to be a whole lot less particular about everything. Dirty toilets, packing strategies, cream in my coffee, personal appearance. Daily organic green smoothies are a distant, tearful memory. Staring down my Fitbit and bathroom scale, I began living like a prisoner, eating whatever was offered me whenever it arrived, with a grateful heart. Lots of carbs plus digging in the box of Sees candy because I could reach it from my rolling chair. Don’t judge. Hubby says I create work for myself. It’s hard to hear, but it’s true, dangit. (Back to liking things the way I like them, which always requires more toil). I’m hosting overseas guests for breakfast in the middle of all my dust and boxes this morning. I want things nice. But I don’t have orange juice, enough tortillas or a pastry to serve with the meal. I can’t thoroughly clean on one leg, or make a quick trip to the grocery store to add all the bells and whistles. Oh well. So I cut the tortillas in half to make them look like more, added toast as an option and pulled out whip cream for the sliced fruit salad instead of serving a coffee cake. Good enough has to be good enough and something about that seems like a healthy adjustment to this driven perfectionist sitting in her chair. As I sit here typing, surveying all around me that needs ‘doing,’ the simplest of tasks I am currently unable to accomplish; the flies buzzing around my head I can’t chase, the stacks of boxes I’ve yet to unpack and organize, my delayed errands begging to be done, that gadget I cannot reach! ad infinitum, I feeeeeeel the burrrrnnnnn. I painfully acknowledge my inability to control my circumstances toward my preferred outcome. And I surrender. Several times a day. And pray. And today I wipe away a few tears. 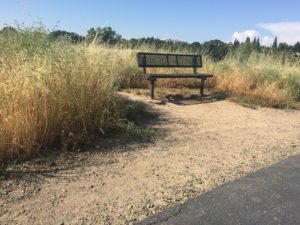 And I recall a statement I made in my May 24th blog post, “Patience is produced by painful endurance.” I’m sure all this delayed gratification during my move is working something good in me, somehow. And suddenly my whole life depended on someone else. The day my ankle broke, I felt myself sinking to the bottom of the ocean as I surveyed the moving detail needing attention in the following 6 days. My friends instinctively knew and they texted, emailed, and showed up to help. (Why is it so hard to accept help??!) I honestly didn’t know they loved me enough to serve me so selflessly. 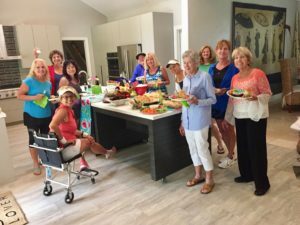 We had played tennis, celebrated birthdays, enjoyed happy hours and Bunco….but this??! No one wants to pack someone else’s crap. They saw me at my weakest point and threw me a lifeline as I was drowning in desperation. Hashtag bonding. People often don’t say what they’re thinking until a point of crisis when life as we know it comes to a screeching halt. I was dumbfounded at the verbal expressions of love and friendship I received throughout my dark tunnel from friends and neighbors. Time stood still long enough for hearts to be bared, stories shared, and precious words spoken that might never have been heard, had I been walking on two healthy legs, not moving to another state. Priceless. I’ve reflected on those words throughout my days, my tears, my groans, and my long waits. Until next time, you’ll find me hanging onto that hope!